Editor’s Note: Rochelle Beck, the strategic communication lead at Ashoka Full Economic Citizenship, is guest curating NextBillion’s monthly-long series on Housing for All in partnership with Ashoka. This special series coincides with two upcoming Ashoka publications on best strategies to achieve Housing for All, Ashoka’s initiatives using its Hybrid Value Chain framework to leverage changes in the affordable housing sector in Brazil, Colombia and India. As of 2008, for the first time in the world’s history, more people lived in cities than on rural lands. One third of these city-dwellers – one billion people, or one-sixth of the world’s population – live in slums and shantytowns in deplorable conditions, often without access to basic sanitation, safe drinking water, minimal structural integrity, let alone a house built to withstand earthquakes or floods, amid garbage and vermin, with poor quality or faraway schools and health care, and where narrow streets and poverty breed not only disease but daily risks of violence. Urban slums are the fastest growing human habitat. The UN projects that by 2030, this number will triple: over 3 billion people will live in urban slums. A nightmare for slum-dwellers, a black cloud over their children’s future, a powder keg for cities’ management and health, a drain on national productivity and economic growth. A trillion dollar BoP housing market? Impossible, you say? If you add up the materials to be produced, distributed and sold, the loans for mortgages, improvements or construction, the jobs and income generated, the land purchased, infrastructure to be built – all the related products and services to meet the affordable housing gap globally – it amounts to a multi-trillion dollar opportunity for multiple areas of employment and economic growth. So why aren’t we hearing the sounds of massive housing construction projects under way? As we listen to colleagues working on different aspects of affordable housing around the globe, it seems that the very size of what is needed to close the affordable housing gap looms too large for any one of the stakeholders to grab onto and succeed. Some builders and developers see significant potential profits, but have no accurate market information about what their new potential customers – slum dwellers – need, want, currently spend or can afford. Nor have they figured out how to get that accurate information. Their marketing and sales forces have little or no experience in slums, nor trusted working relationships with those who do. And if a barrier such as land title or inadequate finance for mortgages for their new potential BoP clients emerges, it’s often enough to sink their interest. They leave money on the table and walk away for a deal somewhere else they know how to approach. Local and national governments see the huge numbers needing safer housing – 26 million in India alone, for example – but also know they cannot afford to build or subsidize all that is needed. They become frustrated when they spend funds to build public housing, only to have a tiny fraction of the need met, slum problems continue unabated, and worse, see any potential benefits eroded by poor planning or corruption. Unintentionally, their subsidies can undermine housing market value for private real estate development. Many well-intentioned charitable investors in affordable housing have lost confidence for similar reasons. Further, traditional private real estate development models, as well as government agencies and charities, still rely on the formal housing industry to solve the shortage by building new homes in large numbers, without recognizing that almost 80 percent of BoP affordable housing is self-built and self-financed, a consequence of being ignored by big companies, retail chains and financial institutions. It often represents decades of saving, bit by bit, and building or repairing, bit by bit, as time and income allow, and is the only tangible asset the family has. Off the formal economic grid, and largely ignored by housing sector value chains developed for the middle and upper classes, most BoP families rely on their own resourcefulness to put a roof, even if leaky, over their heads. This series gives us all the opportunity to break down this massive problem — and the equally massive social and economic opportunity — into its various threads. And to hear from many voices, with perspectives from different parts of the world, from experts, entrepreneurs, business executives and community leaders – all of whom care deeply about finding solutions that work at scale. What are the key thorny issues preventing commercial solutions from getting off the ground in great numbers and growing to global scale? Who’s tackling them? If we found a way to close the affordable housing gap by 50 percent by 2025, how many carpenters, electricians, cement mixers, bricklayers, engineers, architects, local hardware stores, etc. would need to be trained, certified and distributed? What are the implications? The ROI? Who exactly are affordable housing clients? What do we learn when we look more closely at what exactly “BoP” means for housing? Have there been advances in construction materials to build houses better, safer, energy efficient and affordably? What’s still needed to make them widely and affordably available? Are there earthquake resistant designs that BoP housing can afford? Have building safety and integrity standards been developed that protect residents but do not make home improvements too costly to afford? How are banks, mortgage companies, microfinance institutions and community savings and loan companies or co-ops developing new financial products and services for this sector and population? Is financing enough to ensure building or owning affordable housing? What about quality? Meeting customers’ needs? How to mobilize or leverage savings more effectively? What are the benefits of bundling technical assistance services with finance? Beyond profits and economic growth, what else does quality affordable housing mean? To communities? To families? To long-term movement from consumers who are informal and invisible to ones participating actively in the formal economy? We are excited to find and share these housing-specific examples. But we’ve also learned that as good as any of these ideas are, we still need to address issues of scale, of how to draw on the energy and insights that are cross-sector and cross-discipline. If the challenge of affordable housing is too big for any one of its major stakeholders to accomplish alone at scale, then, are there emerging alliances or innovative business frameworks that are putting diverse stakeholders in close touch with each other, over time, to succeed together? Facilitating their communication? Building trusted relationships? Breaking down the individual silos of knowledge, expertise, invention and resources? Is it possible to get huge global corporations to involve their BoP clients in product design, pricing, marketing, more effective distribution channels? What happens when they do? What are the advantages of working with the citizen organizations to improve housing value chains appropriate to BoP circumstances? What successes can they help achieve, especially in areas of land tenure, family financial literacy and savings, aggregating demand for financial services that reduce banks’ costs of outreach by qualifying trusted clients’ credit worthiness? Or working to get access to public services such as sanitation and water systems, sidewalks and play areas, electricity, etc.? How can we build on these new systems to bring down the traditional walls between business and citizens, governments and entrepreneurs, researchers and pragmatic planners? We’ll have posts that will focus on these questions, from practitioners reporting from their direct field experiences to those whose work spans geography and local contexts to offer ways to reach national, regional and global scale. Check back here often during October. Share your thoughts. There’s a multi-trillion market waiting to be tapped, and a billion people needing more than a roof over their heads. 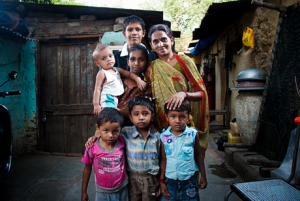 (A family in Ahmedabad slums. Image credit: Ross Mytton). Note: Two major Ashoka reports and a video will be available soon. One is Access to Affordable Housing, with case studies and recommendations looking at selected strategies to achieve Housing for All using hybrid value chain alliances. The other is the findings of the first ever Global Summit of Housing Entrepreneurs, convened by Ashoka with the support of the Hilti Foundation, with a video of participants’ insights and reflections for the future of affordable housing. Both publications are available free of charge. For more information or to order them, contact ahughes@ashoka.org.